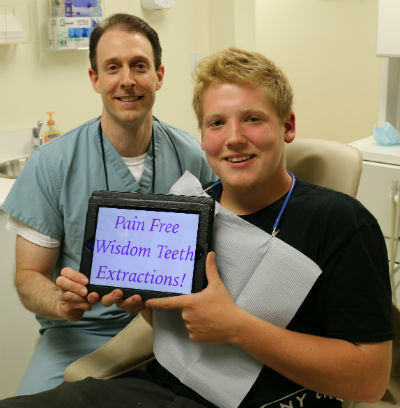 Dr. Nick Calcaterra and one of hundreds of wisdom teeth extraction patients. Are you covered by Husky and are 20 years old or younger and need your wisdom teeth removed? If yes, then you’ve come to to right place! Dr. Nick Calcaterra is one of Connecticut’s most experienced dentists in removing third molars, having removed thousands of wisdom teeth on teenagers and adults with all types of insurance. And with his ability to put you out using IV sedation, you won’t remember a thing! Many offices that participate with Husky advertise third molar removal and talk about having an oral surgeon on staff. Then, on arrival, you find out it’s not the case. You’re given a referral to an office far away and the wait for an appointment can be weeks. Not here! Dr. Nick does this procedure on a near daily basis with sedation. You come in for a consult and he personally reviews your case with you. After the consult, we schedule you, you come in, get sedated, get the teeth out, and then you’re done. It’s that simple. Want to actually see what it is like to be treated in our office? Watch Adrianna – who has Husky and was 18 years old at the time – experience her third molar extractions and getting a root canal under IV sedation by Dr. Nick Calcaterra. As you can see, all of our patients receive personalized care and attention by Dr. Nick Calcaterra and his excellent staff. This is the norm for our office. Here you can watch Jennifer talk about her experiences in our office. She also had Husky State Insurance. Jennifer is still a patient of ours. Every time she comes in – we joke with her. She doesn’t remember anything of the procedure – because of us putting her out with IV sedation – and we jokingly remind her of the silly things she did after her sedation. 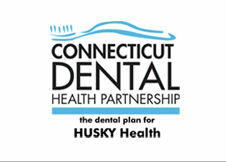 Husky Insurance, often times called Husky Health (or sometimes called Connecticut State Insurance or also Medicaid) offers dental coverage to participants. The coverage includes dental services. Oral surgical services such as third molar extractions are included. As an office, we participate for patients 20 and younger. Husky patients needing wisdom teeth removal are able to get their third molars extracted along with IV sedation at our office. We do this procedure all the time. We are experts at it. And for those patients 20 and younger with Husky A insurance, the procedure is covered 100%. 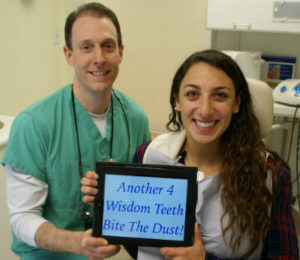 Another 4 wisdom teeth gone, another smiling patient with Dr. Nick. Experience. Dr. Nick Calcaterra has removed thousands of wisdom teeth and performed hundreds of sedations. He does this all the time and has the experience to do it right. Compassion. How many doctors give you their personal cell phone after the surgery? Dr Nick does it for ALL of his third molar sedation patients. Convenience. Very few offices offer this with sedation for Husky patients. We do. We offer convenient hours and a great New Haven county location. We extend our hours during school vacations to accommodate the volume of teenage patients we see. We can nearly always get you in. Knowledge of Husky. After doing several hundred oral surgery cases on Husky patients 20 and younger, we know our way around the CT State insurance system and know how to get things done. Dr. Nick Calcaterra has performed oral surgery with and without sedation on Husky patients 20 and younger in Orange and all the major surrounding towns including Milford, Bridgeport, Derby, Ansonia, Shelton, Hamden, North Haven, West Haven, New Haven, East Haven, and many other towns. Call us (203) 799 – 2929 or visit this page to request an appointment.